I should confess from the start that I’m an Ipswich fan but having lived in Brighton for thirty years. I’m one of those rare footy fans that has two teams for a good reason and so I’m happy to support Brighton whenever they’re not playing Ipswich. 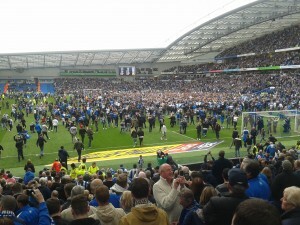 Two years ago a friend of mine asked me if I would go to Brighton football matches with him and I agreed. At the time they weren’t doing that well but the experience of being in the ground on the day is always worth doing if you can and so it all began. I began to work my magic and before very long we had started to win matches and climb the table. But that first season it was not to be, an injury crisis mid way through and a further one in the playoffs meant we experienced the bitter taste of defeat in the play-offs. The second season kicked off and everyone was wondering had the squad been damaged by the previous seasons experience. It didn’t take long to see that was not the case. Almost from the start of the season they had that glow that some teams have when they’re at their zenith. It’s a rare privilege to watch a team at those times ( I watched it at Ipswich in the late seventies and haven’t seen it since, until now). All season they’ve been confident, relentlessly passing the ball around the opposition and somehow, always somehow scoring when it mattered (except against Ipswich of course 😉 who managed a draw). I think we all knew that they were going up when they crushed Norwich (scum) 5-0 and of course for me that was a great day. I had been at the 1998 game where Ipswich thrashed Norwich by the same score and the memories flooded back. 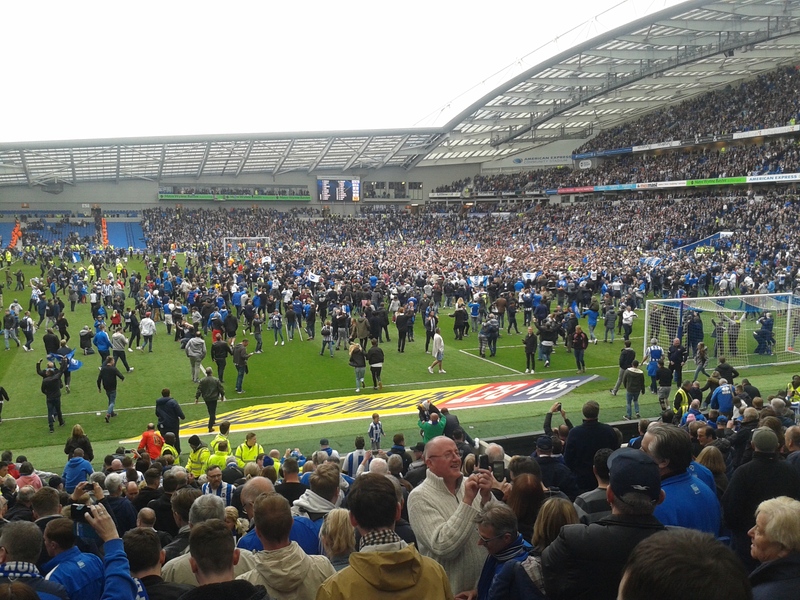 Dancing with the Brighton fans in the aisles of the North stand while the scum were battered on the pitch was a major highlight of the season. My friend and I have been on a journey together, the highs and the lows and yesterday it all came together to give us a wonderful finish to our journey (we can’t afford to support them next year). I didn’t doubt they would win this game and in truth they never looked like it despite faltering slightly in the last quarter of an hour. When the final whistle blew we shook hands with tears in our eyes and just stood in the stand and watched the fans invade the pitch, we wanted to take in the scene and a wonderful sight it was too. Quietly, at the end, we crept on to the pitch just to stand on the corner flag and say we were there. Chris my old mate. Nothing will ever take this from us, two years of memories culminating in glory!